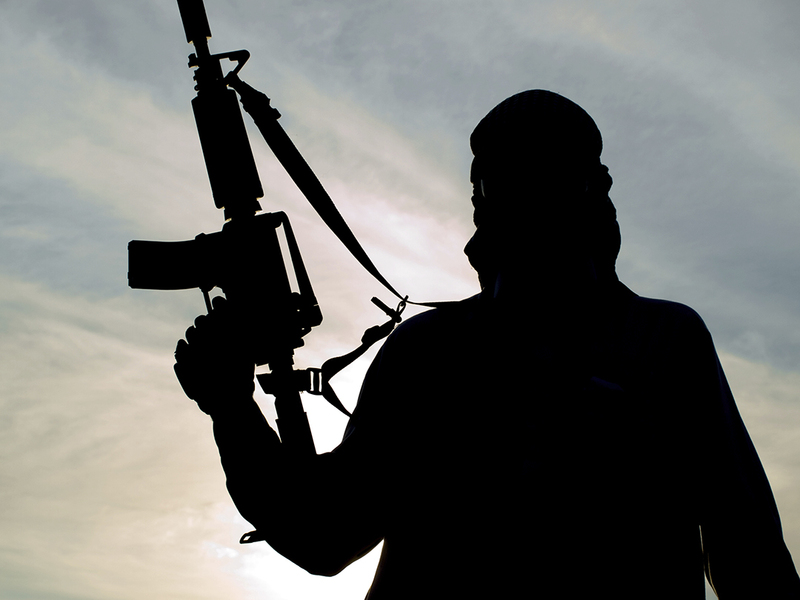 Some people have claimed that autonomous vehicles will end terrorism. How is that possible? What do cars that drive themselves possibly have to do with geopolitical conflict? How could an autonomous vehicle make people that live ten thousand miles away lose interest in expressing violent manifestations of dissatisfaction at Western cultures? This website is dedicated to describing how the advent of autonomous vehicle technology will cause a macro societal transformation in the way that consumers all around the world use automobiles. This transformation will cause upheaval in many parts of American and global society, but the disruption most relevant to this subject is the fact that automobile usage in The Mobility Cloud heavily favors electrification of the automobile. Once it’s overwhelmingly advantageous to fleet vehicle operators in The Mobility Cloud to use electric vehicles, they will start investing in that technology almost to the complete exclusion of internal combustion vehicles. If America’s consumer transportation fleet becomes almost completely electric, that’s going to cause an enormous macroeconomic change in America’s oil importation habits. But what will that change be? Can we quantify it? Let’s find out. America imported 7.1 billion barrels of petroleum products in 2015.1 The analysis I’m about to do is slightly muddied because America primarily imports crude oil (78% of imports)2 rather than gasoline or other refined petroleum products. America then uses its massive refining capacity to turn this crude oil into gasoline and diesel fuel and many other petroleum products. The excess refined petroleum product that we don’t consume is exported to other nations. If one balances all the imports and exports, America net imports about 40% of all the oil3 we need to meet our energy needs. Again, I’m simplifying across refined and unrefined petroleum products, but for the broad stroke of this analysis these numbers are usable. Our appetite for petroleum products is staggering and in particular, our consumption of motor fuels like gasoline and diesel is enormous. In 2015, America consumed 140 billion gallons of gasoline.4 It’s difficult to measure diesel used strictly for transportation from the supply side because diesel production is grouped together with heating oil, which is not used for transportation and a lot of diesel is used for purposes other than transportation as well. If we look at it from the demand side, though, we learn that 4% of all vehicles in America5 are diesel powered, and that 4% of vehicles is heavily biased toward larger vehicles with worse fuel efficiency than the average gasoline car. So to account for diesel consumption let’s say that diesel vehicles account for 5% of all the transportation fuel consumed in America, which, doing the math, would equal 7.4 billion gallons annually. So adding 7.4 billion gallons of diesel to 140 billion gallons of gasoline consumption means that our total transportation fuel consumption is 147 billion gallons per year. There are 42 gallons in a barrel of oil, so this 147 billion gallons of transportation fuel required 3.5 billion barrels of crude oil to produce, which is 49% of the 7.1 billion barrels6 of crude and other petroleum products that America imported in 2015. So autonomous vehicle technology can’t end the importation of foreign oil, but it can cut it in half. This is where autonomous cars can start to impact national energy policy and international geopolitical dynamics. We just learned that autonomous vehicles have the potential to cut our oil imports in half. What does that mean? Does that mean America will buy half as much oil from Saudi Arabia and we’ll have half as much terrorism? Hardly. 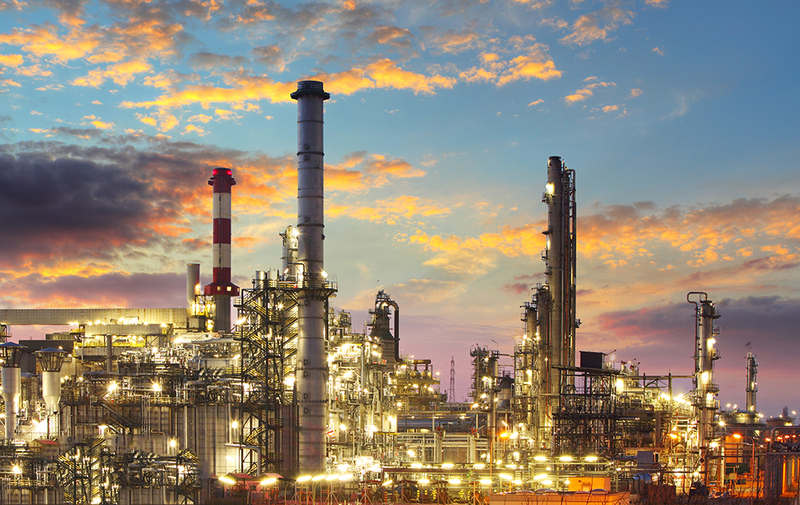 The next step in this analysis requires understanding where our oil comes from. In a poll in 2015 it was revealed that Americans think this is where we primarily source our oil. 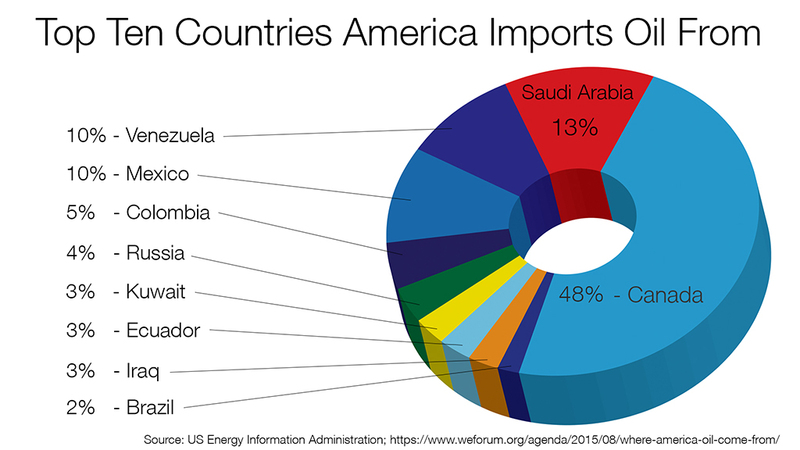 The truth is that in the first half of 2015 the top ten exporters of oil to America were the countries depicted in the pie chart below. This misperception is the result of media attention that’s been given to the relationship between the global petroleum market and political instability in the Persian Gulf region, including the funding of and motivations behind terrorism. Note that Canada is overwhelmingly our major source of petroleum. Saudi Arabia is in a strong second place and while Kuwait and Iraq are both on the chart they are both further down the chart. The sort of terrorism that’s associated with the world oil economy, however, is really a problem that’s associated with the Persian Gulf region rather than one that’s tied to any individual country. Every five years it seems to be a different country that is causing America most of the problems from that region. America invaded Iraq in the early 1990’s. Iran has been a problem for decades. Osama bin Laden was from Saudi Arabia. 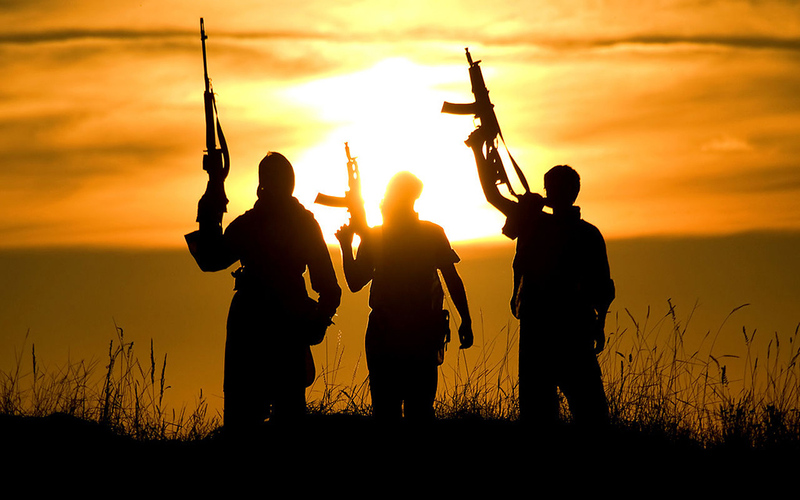 Right now ISIS in Syria and Iraq is giving us the biggest headaches. Given this diversity, it’s more meaningful to look at this from a regional standpoint rather than a nation by nation perspective. 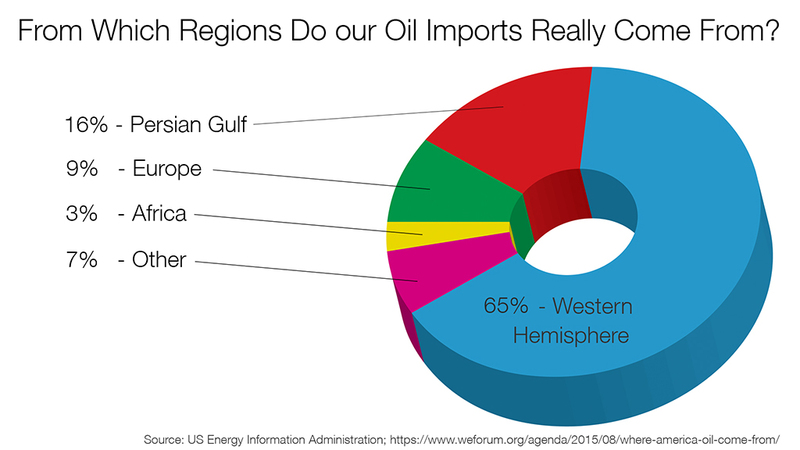 This pie chart below shows where we imported all of our oil from by region in the first half of 2015. 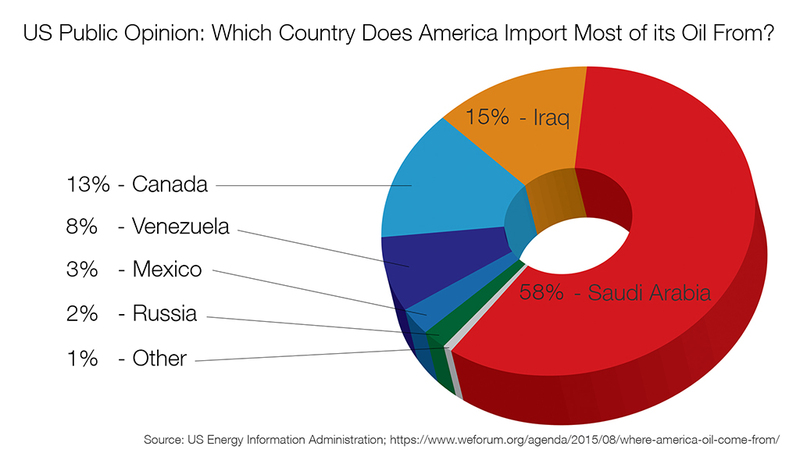 This pie chart tells us that we only import 16% of our oil from the Persian Gulf region. 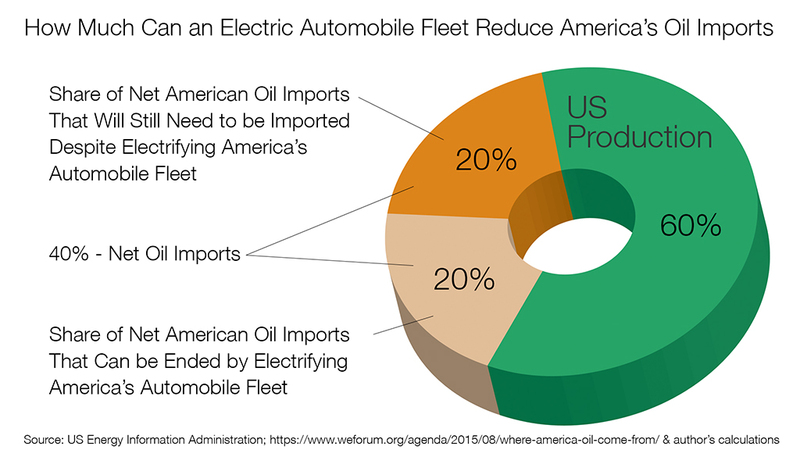 We learned earlier that electrification of our national automobile fleet, which will be inevitable in a world of on-demand transportation, will allow us to reduce our imports by 3.5 billions barrels per year, which is almost exactly half of all imports. That means that if nothing else changed, we could stop importing oil not just from the Persian Gulf region, but from every single country outside the Western Hemisphere while simultaneously reducing our imports from North and South America by 23%, which, if we so chose, could mean that America would purchase 90-95% of our crude oil from Canada and obtain the rest from our southern neighbor, Mexico. That’s pretty exciting. Autonomous cars could reduce our oil importation habits such that we only purchase oil from primarily Canada and secondarily Mexico. Does that mean we won’t see this guy any more? That’s really the big question. To answer it, first of all keep in mind that this transition to a commercially owned, all-electric automobile fleet, and consequent reduction of our oil imports, will take decades, and probably more than twenty or thirty years. This is a very long game that we’re playing. Even if we give it enough time for our automobile fleet to completely electrify, that only reduces our overall national petroleum needs by about 20%, which is still an incredible improvement, but not nearly enough to get us entirely off petroleum products. We still need them. If we’re not buying any crude oil from the Middle East, that means America can pack up its air bases in Saudi Arabia, bring the Fifth Fleet that’s currently steaming around the Persian Gulf home and stop having our soldiers traipse around the desert, right? The answer to that is, “maybe.” On one hand, even if America herself isn’t purchasing crude oil from The Persian Gulf, that region’s extraction capability still has to be available on the world market in order to stabilize and feed global oil markets. If Middle Eastern oil extraction or distribution capacity is compromised that would have a huge effect on the world petroleum market. That’s why it’s in America’s strategic interest to protect all the oil producing capacity in the Persian Gulf, even if we’re not personally customers for it. On the other hand, with America’s bloated and continually growing federal deficit, will we be willing to protect the Middle Eastern oil industry primarily so that SE Asia and China can benefit from it? Especially considering that competition from China and the Four Asian Tigers have played a large role in the decline in the American industry in the past several decades. America isn’t very excited about the prospect of ceding military control of this region to China, Russia (it would be in Russia’s strategic but not economic interest to do so), or, heaven forbid, Iran, but we’re not thrilled with a being nineteen trillion dollars in debt7 either. Great Britain ensured access to the Middle East’s oil industry with their military from the 1700’s until World War Two, but was so reduced by the war that in the following years they closed all their bases “East of Suez.” It’s not hard to imagine that America may go through a similar rebalance of our strategic interests against our economic limitations in the coming decades, and if that happens, understand that the primary source of conflict between the Western and Muslim world will be removed. No more importing oil from the Persian Gulf means America doesn’t have to be involved in wars in the Middle East. The end of the US military’s presence in the Middle East means the end, or at least a dramatic reduction in Middle Eastern based terrorism. No more terrorism is an enormous step toward healing the damaged global relationship between the Western and Muslim world. Whichever way this goes, don’t let the more subtle point be lost here, though. Regardless of whether or not America chooses to end its military stewardship of the Persian Gulf, cutting our national oil importation by half and ending all oil imports from the Persian Gulf is a huge step in disentangling America from the Middle East. America and the Gulf States are still heavily enmeshed in other ways, but those cultural, commercial and other interests are largely conducted by choice. We don’t currently have the choice to stop purchasing oil from Gulf states. Autonomous vehicles very will likely change that.